I barely noticed this when I read the issue. I remember at the time thinking, “Hmm, that’s kind of a strange attitude for someone in Havok’s position to have.” But I didn’t think of it much beyond that. If you’ve read the link above, you’ll see some detail on why it’s such an odd thing for Havok to say. Alex Summers is a member of a minority group — namely, mutants — which in the Marvel Universe, definitely qualifies as oppressed. The government periodically tries to outlaw and imprison them and people sometimes kill mutants, all on the basis of their genetics. Sure, on the one hand, Alex just wants to be treated like any other human, which is something that every civil rights activist would agree with. 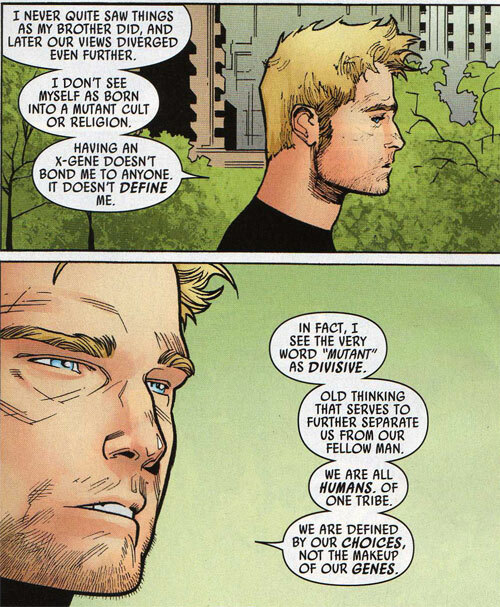 But not wanting to be identified in any way as a mutant, and even considering the word “mutant” to be a slur, makes Havok look like a self-loathing mutant. With that speech, Alex has been cast as, basically, many of the characters from TVTropes’ “Boomerang Bigot” page. If his fellow mutants don’t bust his chops over this in future issues, they’re not doing their jobs. It probably doesn’t help that “Uncanny Avengers” has previously been criticized for being a team of white characters — and in this issue, they added a Japanese character and two more white ones. And it also doesn’t help that writer Rick Remender is reacting to criticism by unleashing his inner douchebag. For all the complaints, however, it must be said that Marvel could’ve handled the whole thing much, much worse. DC Comics, for instance, can barely go a month without some horrific controversy where they kill off another non-white character or ladle on the embarrassing sexism when writing about their female characters. Marvel may not be perfect, but they’re closer to where they should be. What seems to be lost in this controversy is that there people in the “real” world who think like Alex does here. There are people who say (not an actual quote, but a synthesis of positions I’ve heard), “I’m not a black American, I’m an American who happens to be black.” Etc. That doesn’t mean their position is right or wrong. But it does mean Remender’s portrayal of Alex isn’t necessarily out of bounds, either, as realistically there would be a whole spectrum of opinion about mutants from mutants. To insist that every mutant parrot either Xavier’s or Magneto’s opinion, with no other options, would be the unrealistic portrayal. Alex has a past history of self-loathing and disassociating himself with the mutant cause. There was a story called “So Good It Hurts” by Ann Nocenti and John Bolton, for example. He’s the one X-character for whom that speech WOULDN’T be out of character. And if Remender, Jason Aaron, etc. had just said THAT, things would’ve been fine. 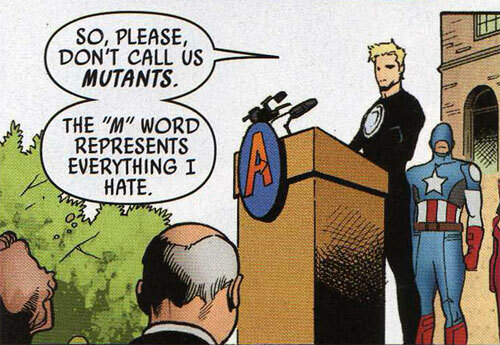 But they went with the whole premise that Marvel mutants aren’t a metaphor for marginalized minority groups. Yeah, sure. Except for EVERY OTHER X-Men related Marvel comic since 1963, INCLUDING the opening story arc Remender wrote for THAT EXACT SAME COMIC SERIES. I think that’s what ended up causing the trouble. It’s not so much that Alex Summers is a twit, but that Remender’s a twit, too.